Mar. 03 /CSRwire/ - DALLAS, TX. - March 4, 2009 - Legions of well-intentioned people worked up a sweat for charity in 2008, but few have a track record of logging miles or collecting cash to rival that of Barbara Jo Kirshbaum. Since 1998, Ms. Kirshbaum has participated in more than 100 long distance, multi-day walks and raised $1,076,500 to support breast cancer research, education access to care. That is why the 70-year-old therapist from Upland, California was honored with the Cash, Sweat & Tears Award at the Run Walk Ride Fundraising Conference in Dallas on March 4. "The ranks of "thon" fundraisers – marathons, walkathons, ride-a-thons -- are rich with stories of people who dig deep within themselves to support critical causes," said David Hessekiel, the Run Walk Ride Fundraising Council’s president. "Barbara Jo Kirshbaum’s dedication of time, energy and spirit is an inspiration to us all." "Barbara Jo Kirshbaum has participated in every Avon Walk for Breast Cancer nationwide since 2002. This past year she reached two amazing milestones, she completed her 100th walk for breast cancer and not only reached – but exceeded! -- her astonishing fund-raising goal of $1 million dollars! That’s one woman – one cause – more than one million dollars! "Barbara Jo is a true inspiration. She has a warm smile and a friendly hug for everyone at the Avon Walks and her tireless efforts prove that anything is possible! 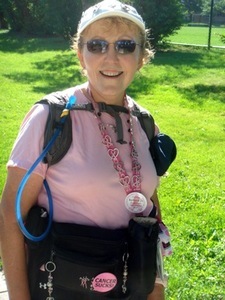 She has walked more than 5,000 miles for the breast cancer cause, and at a spry 70 years old, Barbara Jo has already signed on for all nine Avon Walks in 2009! She keeps going and going – there’s no telling what she’ll achieve next year!" Ms. Kirshbaum was the guest of honor at the Run Walk Ride Fundraising Council’s Cash, Sweat & Tears Award Dinner on March 4 in Dallas. In addition to well-deserved accolades, she received a trophy, a $500 contribution toward her 2009 walk fundraising goal and a certificate for walking apparel and footwear donated by New Balance. Asked about her accomplishments, Ms. Kirshbaum said she had many more miles to walk and dollars to raise: "Many people have asked me if I am continuing to walk and fundraise, since I reached such big goals in 2008. My answer is 'yes', I am continuing because breast cancer is still being diagnosed every 3 minutes. Actually my goals for 2009 are the same as in 1998 when I started at 60 yrs. old. It is about challenging my body and raising as much as I can in the fight against breast cancer. I walk because I can't walk away!"